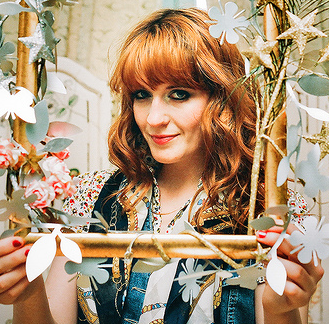 Florence and the Machine is best known for their sprawling, anthemic sound carried by the distinct power that is Florence Welch’s Brit-blues voice, but before they hit it big with their debut Lungs and last year’s Ceremonials, Florence and her partner-in-crime Isabella “The Machine” Summers wrote a song that many interpreted to be about domestic abuse. It isn’t, according to Florence. The song is more a violent analogy than anything. It is, though, a tremendous debut single, and, as I preview what I’m sure will be a great Jones Beach show tomorrow, I want to focus in on what got me into Florence and the Machine in the first place. It’s quite simple. It was this. “Kiss with a Fist” contradicts the majority of the material released by the band. While most songs are feature Florence’s crescendoing voice over a slew of heavy wall-of-sound instrumentation, “Kiss with a Fist” is a punk ditty and Florence sings it with an energetic constancy. I first heard the song on a New York radio station and remembered thinking that there was something refreshing in its throwback to British punk. Florence’s femme fatale vocal in “Kiss with a Fist” is refreshingly cheeky, an audacious middle finger to that thing called love. The single-note, distorted guitar solo towards the end just reaffirms the song’s punk roots, and, like all good punk sons, the repetitive rhythm ends in fewer than three minutes. The Jones Beach show will sure have more of new Florence, but, I do hope she plays this. Her best song, I think.